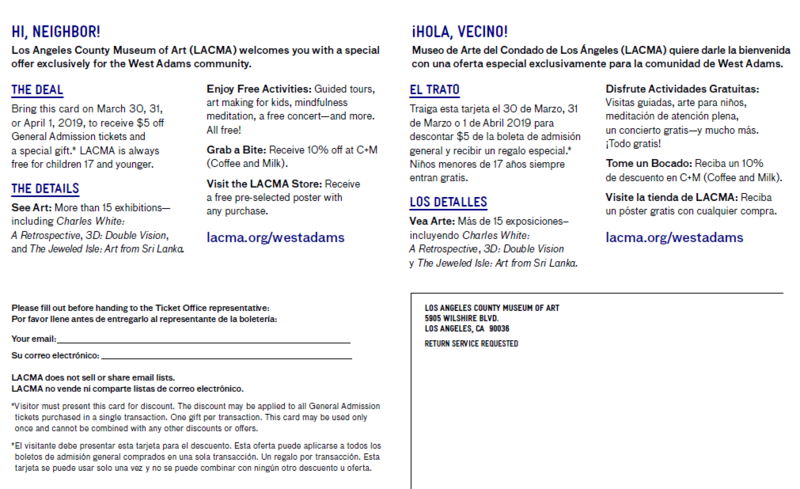 The Los Angeles County Museum of Art (LACMA) welcomes the residents and businesses of West Adams with a special offer exclusively for this historic Los Angeles neighborhood. On March 30, 31, and April 1, 2019, receive $5 off General Admission tickets, a special gift, and other offers throughout the museum. Proof of address in 90016 or 90018 or a copy of the postcard mailed to area homes and distributed at local businesses is required. LACMA is always free for children 17 and younger. See Art: More than 15 exhibitions—including Charles White: A Retrospective, 3D: Double Vision, and The Jeweled Isle: Art from Sri Lanka are now on view. This is the final weekend of 3D: Double Vision.